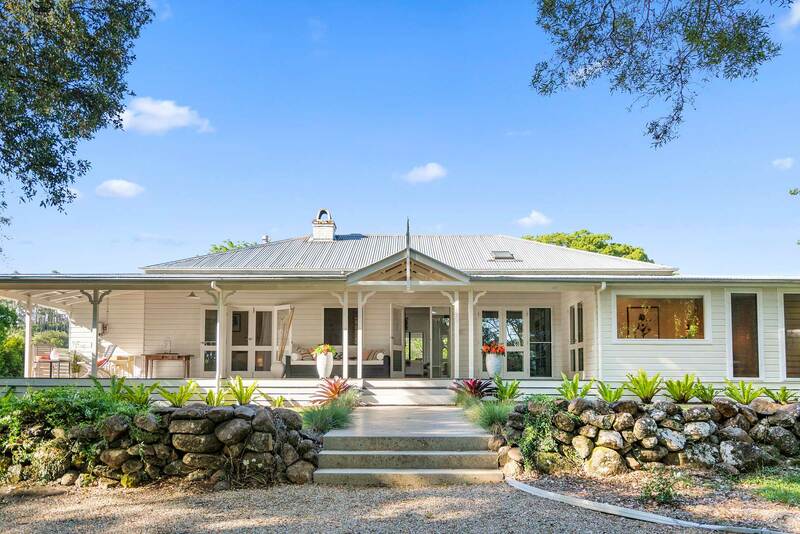 Enjoy space and privacy in the peaceful, rolling hinterland hills, just a short drive from Byron Bay. 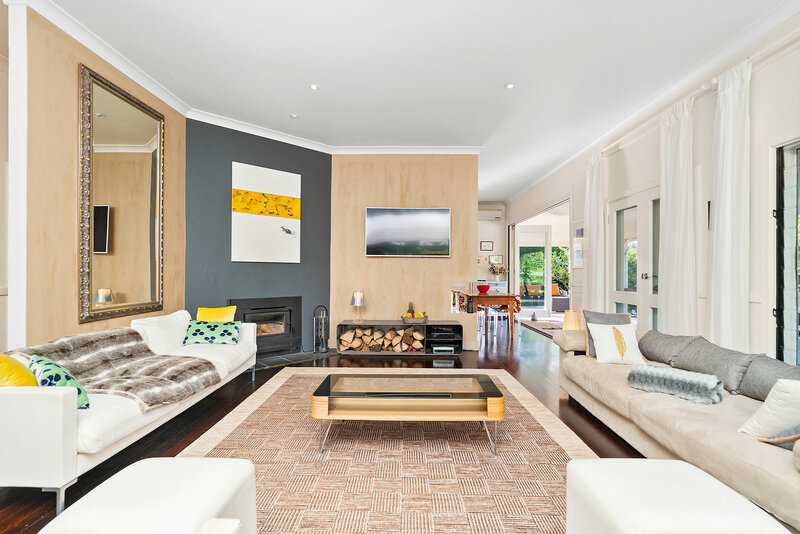 Bellbird is a modern and comfortable family home, bursting with natural light and playful pops of colour. 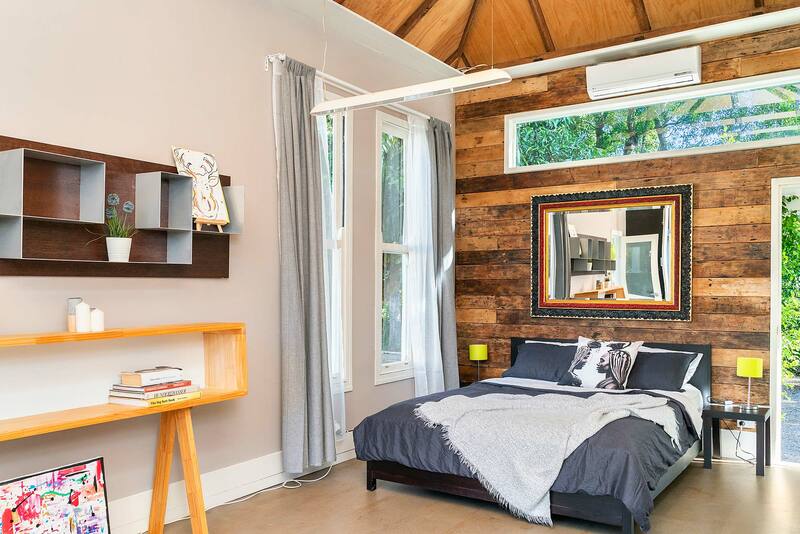 In the main house are 3 stylish bedrooms and 3 bathrooms, with an an additional sleeping space in a separate studio. There is ample space to entertain, lounge, and socialise from the interior areas to the large outdoor deck with incredible swimming pool. 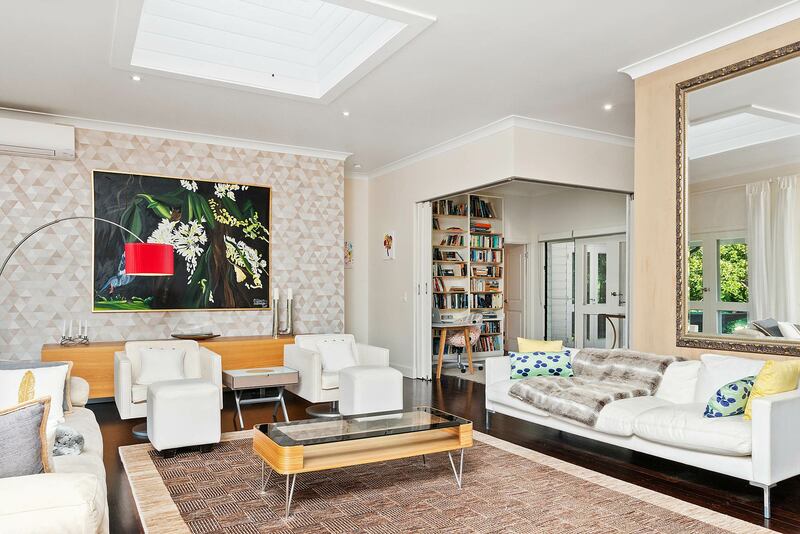 At the centre of this home is a wide, open living space. Ample, comfortable seating is perfectly arranged so that the entire group can enjoy a rousing game of Charades or lively conversation together. Switch on the large Smart TV to enjoy the Foxtel or Netflix programmes. There is reverse-cycle air conditioning to keep the room cool on a hot summer’s day and a wood-burning fireplace for chilly evenings. Natural light floods into the space through a large skylight while two French doors open out onto the rear deck for seamless indoor/outdoor living. Just off the living room is a lovely, modern kitchen and dining area. 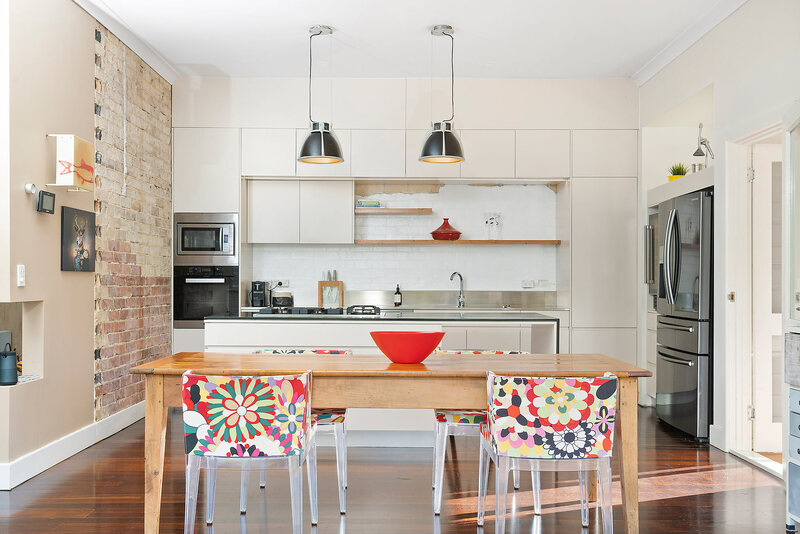 Original, exposed brick is a cool complement to the kitchen’s sleek cabinetry, contemporary countertops, and stainless steel appliances. The kitchen includes a high-end espresso machine, refrigerator with freezer drawers, oven, microwave, and wine fridge. A generous multi-burner stovetop is built into the central kitchen island, the perfect space to prepare and cook any meal. The large dining table with seating for 8 is a nice spot for your morning coffee or a casual meal. 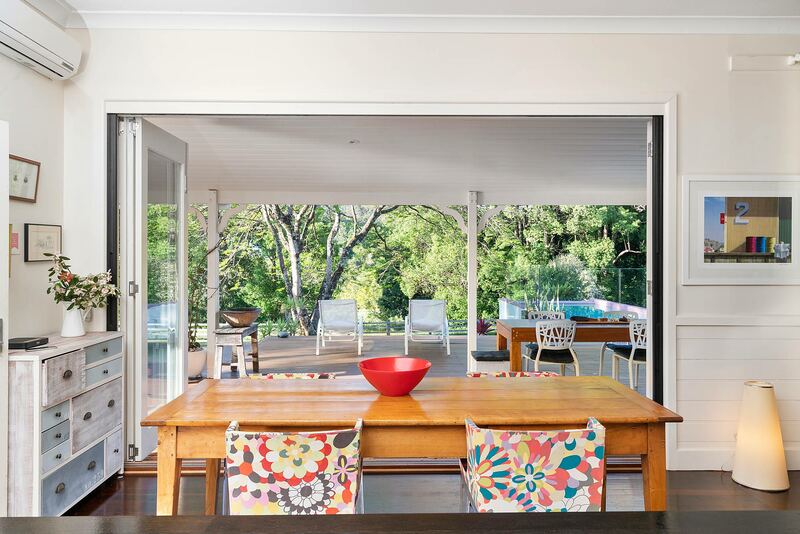 Folding glass doors connect the indoor space to the outdoor deck, where there is even more space to dine al fresco. 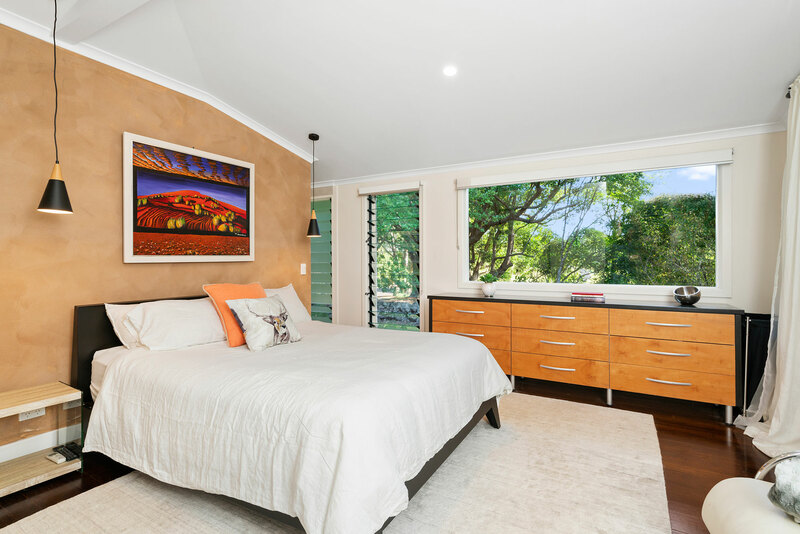 With large windows and vibrant pops of colour, each of Bellbird’s 4 bedrooms offers natural light with a touch of personality. In the master, curl up in the comfortable king bed and enjoy the latest programmes on your own TV with Foxtel. Large French doors open out onto the rear deck while a luxurious ensuite completes the space with a shower and freestanding bath. 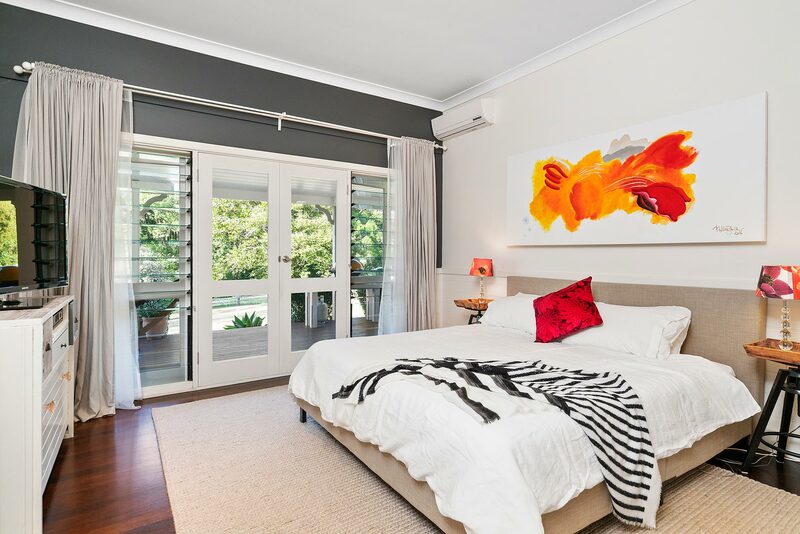 The 2nd bedroom is connected to the study, with a queen bed and an ensuite with shower. The main house’s 3rd bedroom is bright and light, with a queen bed and access to the rear deck through French doors. 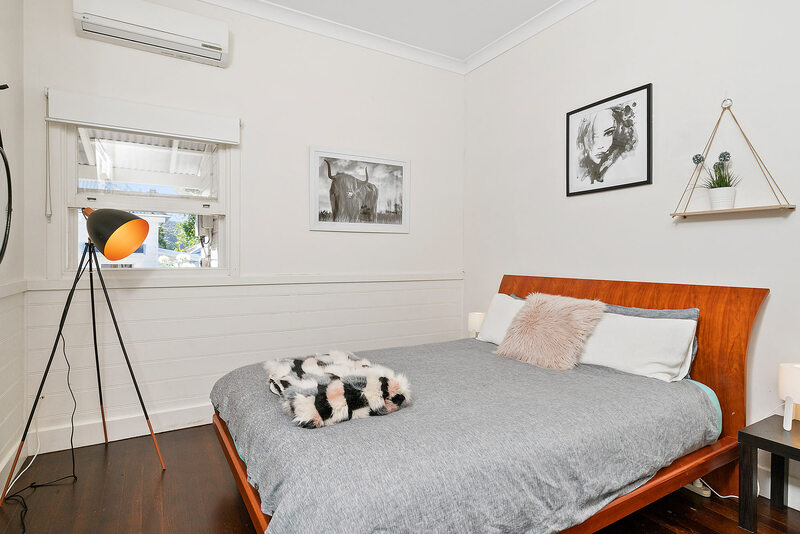 All of the bedrooms at Bellbird are equipped with reverse-cycle air conditioning to ensure a cool, peaceful night’s sleep. The studio is just a few steps away from the main house, down a short path, but feels like a private, quiet retreat. Sky-high ceilings are lined with dramatic wood beams, extending down a timber accent wall. Opposite the queen bed is an enormous picture window, which perfectly frames the manicured lawn and peaceful woodland beyond. There is reverse-cycle air conditioning in the space which shares the third bathroom in the main house. There are 3 modern bathrooms at Bellbird, including 2 ensuites. 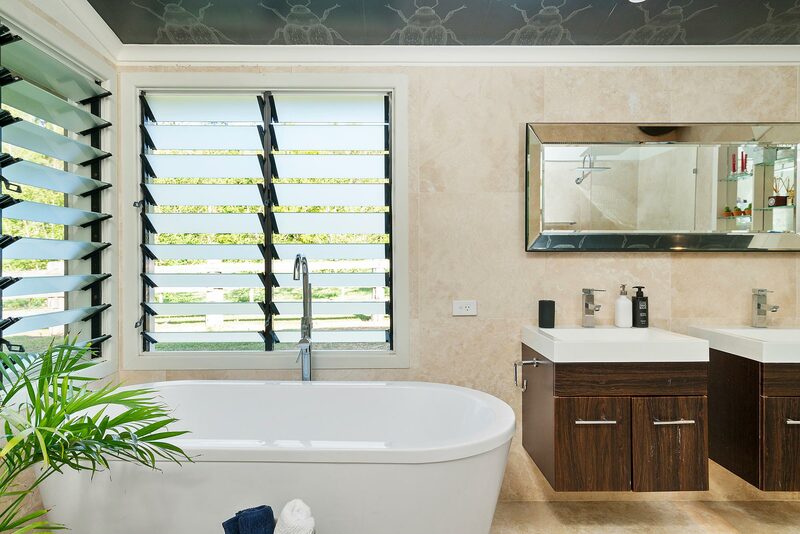 Along with a shower, the master bathroom boasts a gorgeous, freestanding bathtub which is perfect for a luxurious, warm soak to soothe your surf-sore muscles. Don’t forget to look up: One of many quirky, contemporary details at the house is the stunning ceiling wallpaper in the master bath. Both other bathrooms have a glass-enclosed standing shower, generous vanity space, and ample natural light, ensuring your get-ready routine is a breeze. 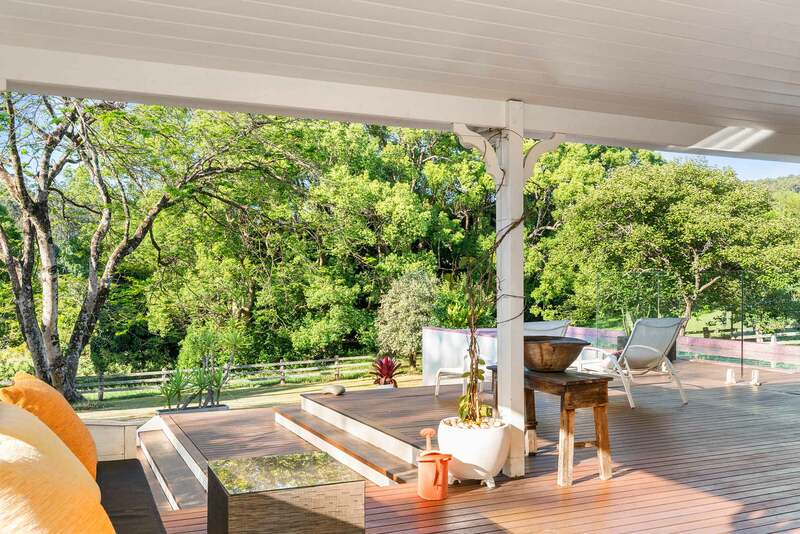 Wrapping around nearly three sides of this gorgeous property is a covered, outdoor deck with multiple places for your friends and family to lounge, dine, and unwind. Picture yourself cosied up in a comfy hammock as it sways gently in the breeze. Enjoy your dinner al fresco at a dining table for 8, conveniently located just off the kitchen through folding glass doors. Spend your days catching rays from one of the sun loungers by the pool and your evenings gathered with family in one of the multiple lounge areas. With a manicured lawn, lush woodland, and rolling hills as your backdrop, entertaining and enjoying the outdoors has never been easier. 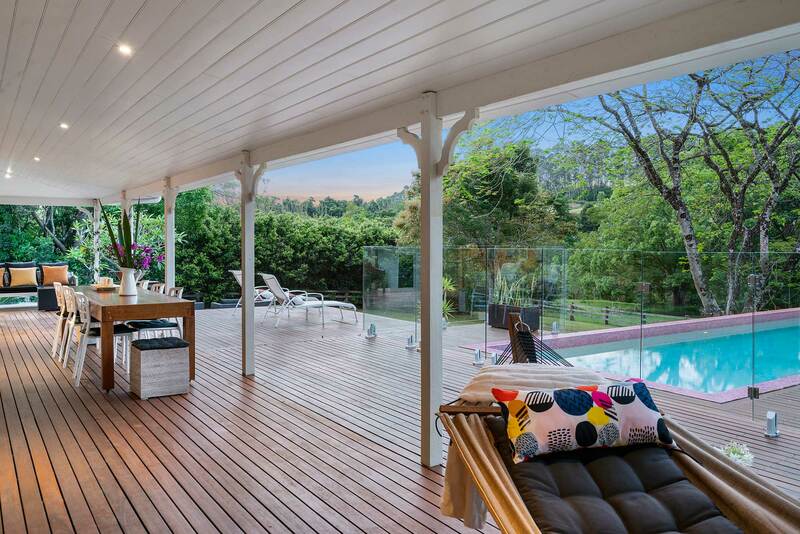 The incredible, above-ground swimming pool is perhaps the most unique feature at Bellbird. 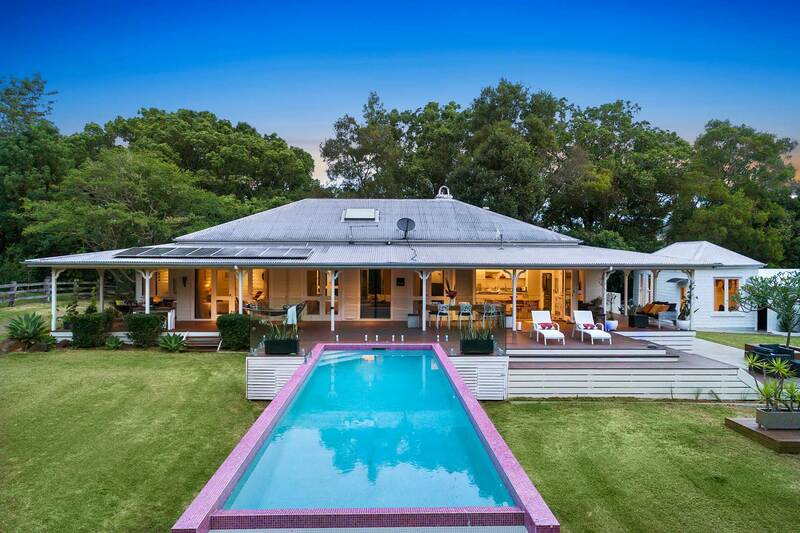 This bold, beautiful pool is lined with fun, pink tiles and extends from the covered outdoor deck out into the the immaculate lawn. 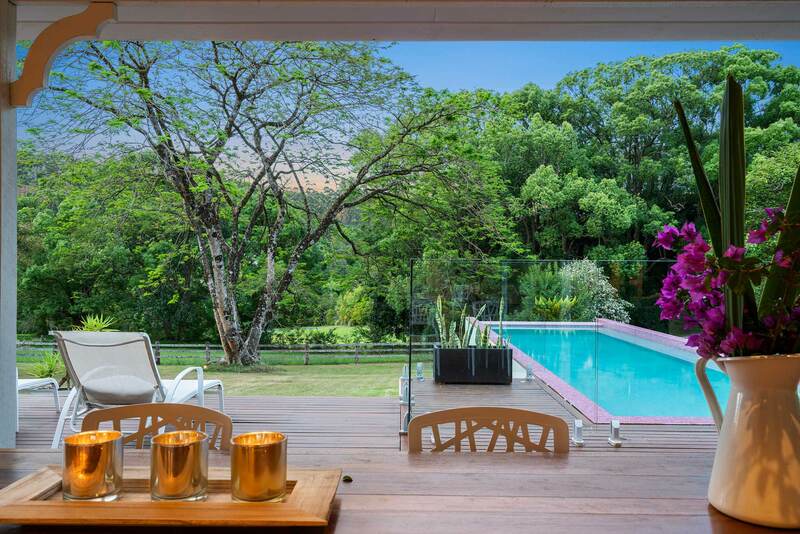 Swim up to the edge to marvel at the rolling, green hills and lush woodland beyond the property. 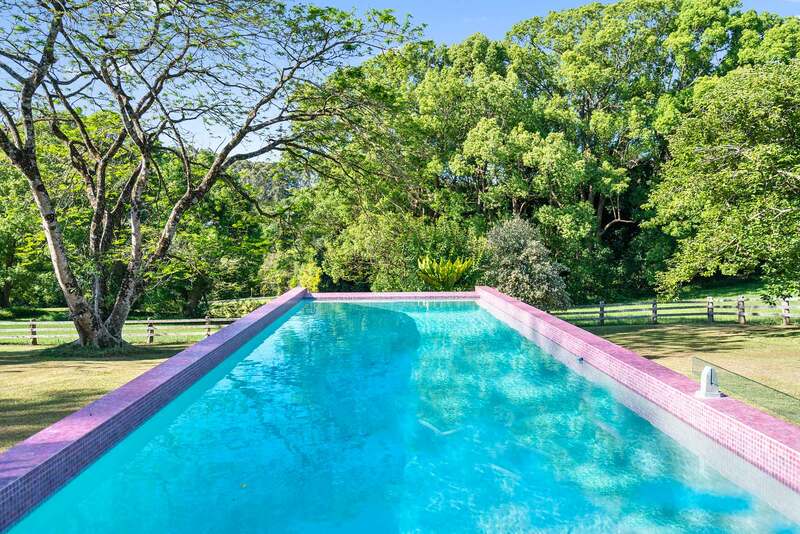 Ideal for a refreshing dip on a hot summer’s day, this stunning pool is surely the place to be during your hinterland holiday. In one corner of the living room, sliding pocket doors conceal a secret. Open them wide to discover a well-equipped office space with a desk and comfortable chair. Whether you need to quickly catch up on emails or continue your work remotely, having a dedicated space to do so is an added bonus. 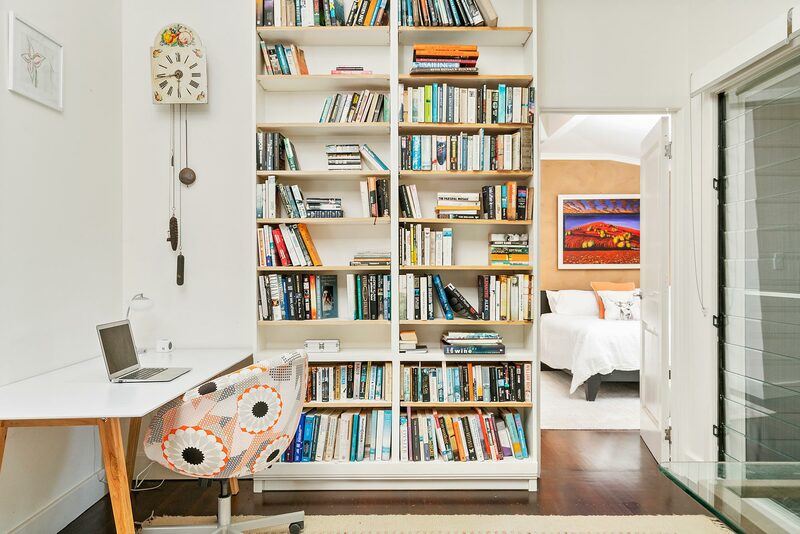 With pocket doors running the length of two walls, the study is easily closed off for for privacy or an optional sleeping space if required, or opened up to the living room. There is parking for 2 cars in the covered garage and space for 2 additional cars off-street. 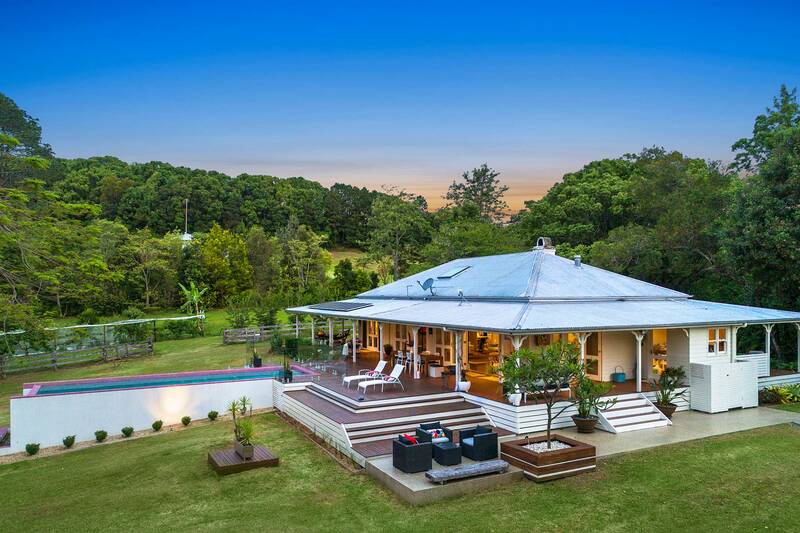 Nestled into the rolling hills of Coorabell, this hinterland hideaway offers peace and privacy in a spacious environment. The charming town of Federal is a short drive away and home to the popular Federal Doma Cafe, a beloved local Japanese eatery. Also within reach are the world-class beaches of Byron Bay, with famous surf breaks, pristine white sand, and turquoise water. 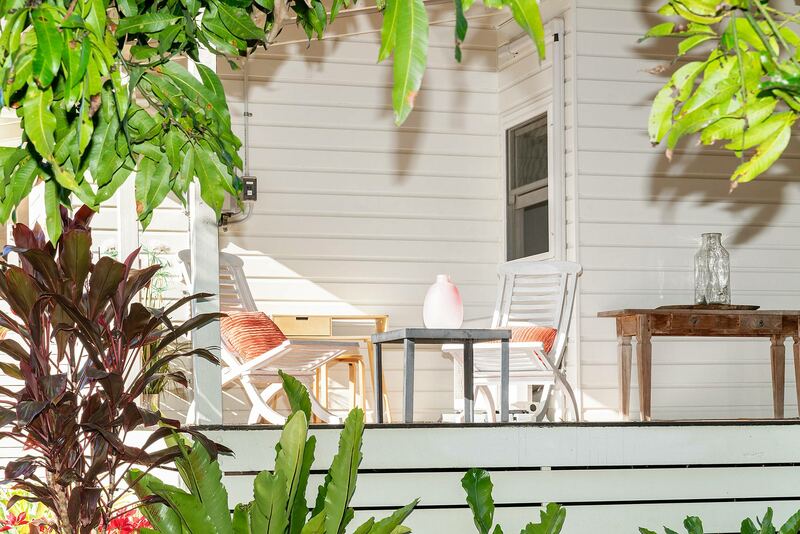 Park your car and wander into town to enjoy beautiful local boutiques, friendly neighbourhood cafes, and vibrant nightlife, then head back to Bellbird to relax in luxury and privacy. 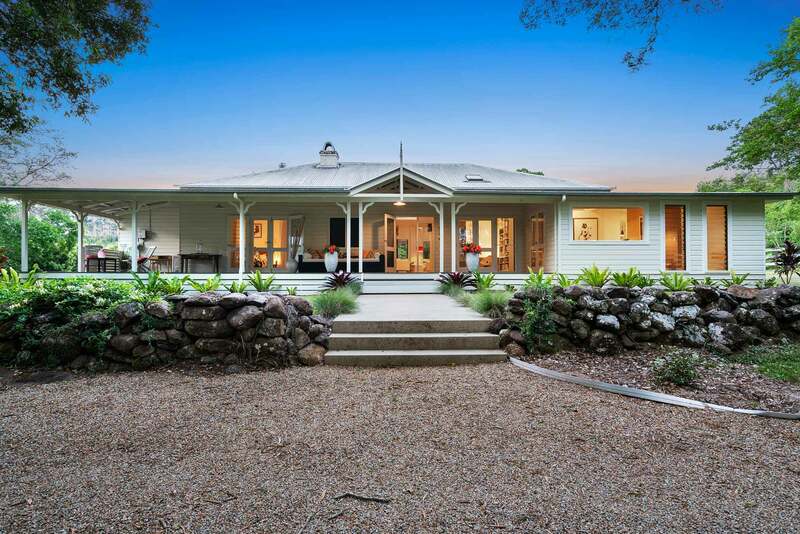 Amazing property in a lovely area! Very quiet and private making it ideal for the perfect stay!